The global humic acids market is highly competitive in nature with a presence of a large number of players operating in it, states a research report by Transparency Market Research. The increasing use of humic acid in diverse industries is attracting a large number of players, resulting in a high level of competition among players throughout the forecast period. The leading players in the global humic acid market are emphasizing on the expansion of the product portfolio, which is likely to accelerate the growth of the overall market in the next few years. Some of the prominent players operating in the humic acid market across the globe are Minerals Technology Inc., Saint Humic Acid, Horizon AG-Products, Humintech GmbH, Omnia Holdings Limited, and Black Earth Humic LP. The increasing number of applications is predicted to accelerate the growth of the market in the coming years. According to the research study by Transparency Market Research, in 2015, the global market for humic acid was worth US$387.1 Mn. The market is likely to register a strong 12.10% CAGR between 2016 and 2024, reaching a value of US$1,041.7 Mn by the end of 2024. From a regional point of view, several developed economies across the globe are anticipated to witness a high level of growth throughout the forecast period. North America and Europe are likely to register a strong growth, thanks to the surging demand for humic acid from diverse industries. Furthermore, the rising population and the growing demand for food are expected to encourage the growth of the humic acid market across Asia Pacific in the next few years. In addition, the increasing pressure in order to acquire maximum output through cultivable lands is predicted to supplement the growth of the market in the near future. On the basis of application, the global market for humic acid has been classified into horticulture, agriculture, ecological bioremediation, dietary supplements, drilling fluids, and others. Among these segments, the agriculture segment is likely to witness a significant growth in the next few years. In 2015, this segment accounted for more than 50% of the global market and is likely to remain in the leading position in the near future. Furthermore, the horticulture segment is predicted to grow considerably in the near future. The increasing awareness among consumers regarding the use of humic acid is likely to contribute significantly towards the growth of the humic acid market in developing nations. A significant boost in the demand for organic food across the globe, owing to the rising inclination towards a healthy lifestyle is estimated to fuel the growth of the global humic acid market in the coming few years. In addition, the increasing concern regarding the use of chemical fertilizers is another major factor expected to accelerate the market’s growth in the coming years. Furthermore, the rise in the demand for humic acid from several industries and the increasing growth prospects in emerging economies are anticipated to contribute towards the growth of the overall market throughout the forecast period. On the flip side, the inconsistency in quality in humic acid that is available across the globe commercially is predicted to restrict the growth of the global humic acid market in the near future. 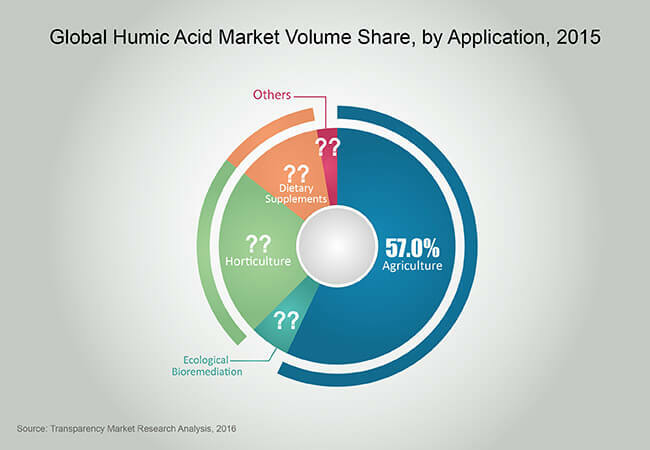 Moreover, the lack of knowledge among consumers concerning the benefits of humic acid is projected to hamper the growth of the overall market throughout the forecast period. Nevertheless, the key players are focusing on developing economies, which is expected to generate lucrative opportunities in the near future. This is likely to fuel the development of the humic acid market across the globe.